Zombies will not see you coming if you wear this awesome t-shirt. 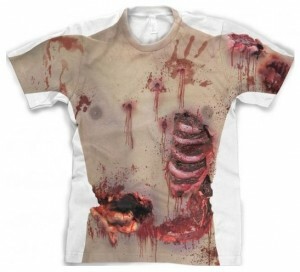 Featured on this t-shirt is the gruesome print of a zombie torso, find the rib cage sticking out, flesh and blood everywhere as well as nice touches like a bloody hand print and find the same on the back with more bones exposed and scar tissue along with bullet holes. You can get the zombie torso t-shirt in a wide variety of sizes and it will be very comfortable and durable to last through all of the wear and tear a zombie may endure. Join the legion of zombies with the Zombie Torso T-Shirt.